but mostly just the things on my mind. This is further reflection on poly- or pluro- doxy given the comment by José in an earlier post that we don't need new language - that the old is good enough. No it is not. Why? Because there wasn't an orthodox Christianity in the second or third centuries from which others deviated and were heretics. This language only works if (1) you have an established historical orthodoxy that dominates the scene or (2) you use it in terms of a theological self-reference, as in my way is orthodox and yours isn't. 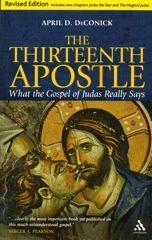 Now some of my readers might like the apostolic church and identify with it, and therefore say that there was an orthodoxy and the apostolic church was it. Everyone else is a heretic. Fine, but this is not a historical perspective. It represents the reality of #(2), not #(1). For instance, let's take Marcion. From a historical perspective (not the apostolic Christian one) Marcion in his era was as much a Christian as anyone else. He established a very viable church with the first NT canon! Jesus Christ was the redeemer. His theology was a radical exegesis of Paul. Now Tertullian hated him and so did Justin Martyr and Irenaeus, all who identified with the apostolic church and all who saw him as heretical. But thousands upon thousands of people loved him, thought him a brilliant Christian theologian, and were members of his churches. These same people saw the apostolic church and its theologians as ignorant. In many parts of Asia Minor, Marcionite churches were not just the mainstay, but the first churches established. They were productive into the 10th century according to Arabic reports. Let's take the Gospel of Judas. Here is a gospel written by someone in the middle of the second century who knew for certain that the apostolic church was run by dupes. This person considered his own views about Jesus and salvation, and his own practices (some type of water ritual), to be the only way to God. He considered himself a gnostic Christian and was quite offended that the apostolic church would be using Jesus' name in such a disgraceful (and demonic) manner - to offer a sacrifice to the lesser god! As historians we cannot be theologians. The texts tell us the story. And this story was a story of many competing orthodoxies, all who claimed for themselves the "Christian" name. At least in the pre-Constantinian period, the marking of a heretic comes from within each of these orthodoxies, and represents their individual understanding of what it means to be the "real" Christians. Apeironadoxy, which should mean 'beliefs without measure', though my Greek is nonexistent and I no doubt put that together wrong. To reflect the state you believe early christianity was in, which would be anarchy, since no one was strong enough to enforce their belief, until the heirarchy formed and promulgated orthodoxy. Whatever the word, it would be best to avoid the idea that these were somehow peacefully coexisting. THEN we should have more than enough cause to use "polydoxy" or "plurodoxy" as a better description of the many and varied Christianly or Christianish or Christian beliefs in history than "orthodoxy." τε πρώτως ἐν Ἀντιοχείᾳ τοὺς μαθητὰς "Χριστιανούς"
And the disciples were called "Christians" first in Antioch. Thank you Dr. DeConick for considering my comment and for your response. I speak of “orthodox” essentially as deriving from the Greek orthodoxos (probably via ecclesiastical Latin), from orthos “straight or right’ + doxa ‘opinion.’ When spelled with a capital letter it refers to the varied Orthodox churches. It is the claim that there is indeed a right, a correct Christian view and from there I maintain that whoever has and accepts that right view is a Christian. I am one of those readers whom you refer to who likes and identifies with the Apostolic Church and I do say that it held the right view regarding the Person and teaching of Jesus Christ sufficient for salvation, and those that reject this teaching or Person are heretics. You say “fine” and I thank you for that much. You add nonetheless, “this is not a historical perspective” and that “as historians we cannot be theologians.” Here I must disagree. As historians we may not be theologians but as theologians we cannot be at odds with the “historical perspective” as Christianity rests totally on a great historical event, the Incarnation of the Son of God and awaits an eschatological event in history that will be the culmination of history. If it should lose it historical connection it becomes a heresy floating in some personal but mystical experience essentially disconnected from time and space. It is that type of experience that is ahistorical and thoroughly subjective, even if it is a valid and transformational experience. I will add that it is those types of experiences and accompanying subjective interpretations, disconnected from the historical reality of the Incarnation and the teaching and praxis of the Apostolic Church, that defines most Gnostic doctrines as heresies. The Christian struggle with heresies is constant and from the very beginnings of the Church. Even Christians may and often do lapse into heresy and apostasy. There should be no conflict whatsoever between objective historical examination and objective theology. The effort to divorce the two often stems from a misunderstanding of the rigors essential to both disciplines. Perhaps later I may comment on what you say regarding the Gospel of Judas’ anti-Apostolic Church perspective and/or Marcion’s deviations. Many blessings to you and I do love your blog. Like a number of others, I disagree with Jose's desire to talk about Christians and heretics, because heresy is a term that is defined from inside a particular group and shifts over time. Those of us who are looking at the history of early Christianity from within Christianity will define the beliefs of some of those early followers of Christ as heretical, but that's not a helpful description of the situation at the time. It's not all that long ago that Catholics and Protestants didn't consider the other group to be genuine Christians. When I was growing up in the Presbyterian church, the Westminster Confession still had a footnote that indicated that it considered the Pope to be the Antichrist. As a Protestant Christian, I take exception to the tendency of some of my older Catholic colleagues to refer to me as belonging to another faith. I think a more neutral term is needed. I think that the objection to terms such as “Christian” and “heretic” comes more from a political correctness, “push-button” reaction to how the terms may have been used to put down particular groups that differed from one’s own beliefs, even burning them at the stake. If we could rise above this and simply relate to the terms objectively we would find that they can be perfectly functional and clear descriptions of who might be “in” and who might be “out.” But contemporary ingrained relativistic thinking with its agnostic penchant or its “I’m Ok, your Ok” approach frightens certain people from wanting to draw any lines, even in terms of the most elementary principals. So, such people cannot even say that a person who claims to be a Christian but makes the most outrageous assertions concerning Christian teaching could be called a heretic. If they cannot even acknowledge this in the most extreme situations they certainly would not be able to entertain fine distinctions that would place anyone off the Christian chart. It’s an “anything goes” mentality as long as you do not make any judgment about right and wrong. The only wrong is making such a judgment. If one makes the most outlandish statements in some sort of mush proclamation it can be called “deep” and “esoteric” but a simple judgment about behavior or wrong teaching in any absolute terms is thoroughly anathema. This is symptomatic of so much of our contemporary mind-set that seeks to blur or ignore distinctions. It’s what the Pope and so many others are intellectually struggling against when they repeatedly speak of relativistic thinking. It permeates our culture not only in religion but also in psychology, art, sociology and the humanities in general, including the study of history. I remember that my anthropology professor could not bring himself to say that there was anything wrong about head-hunter practices among tribes he had live with. One other point: Right and wrong is always decided from “inside a particular group.” In this discussion with many commenting I am the “heretic”—though they would never use that word—because I will not go along with the group view being expressed here. I have no problem with this because it’s in the very nature of discussing diverse perspectives. I’m not interested in finding words that help to blur distinctions. That was a good post today; I enjoyed reading it. I'm a heretic, and happy to be one. The Orthodox like to think they are always 'right' but that's just arrogance - because it's not that heretics are 'wrong', they just have differing beliefs/opinions. They are just as much Christians as Orthodox. Which is what it basically means to be a heretic - to disagree with the catholic church. It's interesting that the word 'heretic' can translate to mean 'freethinker' and 'nonconformist' which I happen to think are good things to be! And, interestingly enough, the word 'protestant' can also translate to 'freethinker' and 'non-conformist'. Thanks for a great post and for a great blog. I realize this is not the forum for theological debates, but I wish to speak my Truth. And, yes, "heresy does make for progress," in a good way, I hope. I believe the problem with the so-called Orthodox, Apostolic Church is its old-fashioned rigidity and resistance to change in an ever-changing world (and changing quickly at that! ), perhaps from a reticence to admit "maybe we aren't so right all the time." Trees that can't or won't bend in a storm will break and topple. Organisms that can't or won't adapt and evolve go extinct. Maybe that adaptation/evolution doesn't necessitate changing what the Church is or admitting it is wrong, but just becoming more inclusive. I may not be a "Christian" by other Christians' standards, but I am a follower of Yeshua's teachings, and I consider him a very beloved teacher, who is very powerful and real to me in Spirit every day. Yes, just like mainstream Christians, I can say I have a deep, abiding personal relationship with Jesus - the rabbi and enlightened master Yeshua. What Christians call the Christ/Holy Spirit comes to all who seek with a pure, open and repentant heart - no matter one's religion or denomination - not just to those who profess and are Orthodox Christians by practice/that definition. Christianity has no monopoly on the Christ entity/Holy Spirit. Since it was most likely, historically, never Yeshua's intent to start a new religion apart from Judaism, then perhaps it's actually a compliment to be considered a heretic by Orthodox Christians. ;-) Call me a heretic, an agent for change! Change is hard, but it's good for all in the end. The Orthodox Church might benefit and gain members (instead of people fleeing the Church, as I did) if it widened its perspective and accepted that its cherished theological doctrines evolved over time, becoming exaggerated beyond simpler origins with the historical Jesus/Yeshua. An evolved theology/Christology of faith does not equate with history, no matter how much stock one puts in faith or trust that the doctrines that have been handed down [supposedly] from the (Jewish) Apostles, after two millennia, are still intact and unchanged to this day. That is just naive, burying one's head in the sand like an ostrich. There are many differing portraits and understandings of who Jesus was/is (from his skin/hair/eye color to whether he was a mystic, sage or apocalyptic preacher/prophet - maybe he was all of those), and they may all be varying shades of "right" stretching out in different directions that emanated from a multi-faceted, charismatic, very complex, and highly spiritual human being. Some believe he was/is God; others believe he was just a man, not divine at all. Others, like me, believe he was both human and divine, but that we are ALL human and divine - that we all have the potential to become the amazing example that Jesus/Yeshua was/is, to realize our own divinity - our birthright! - within. There may not be just one "right." Perhaps the only "wrong" view is one that is intolerant, unbending and exclusive. It is my hope that "insider" orthodox Christians might soon realize that perhaps there are no heretics, just a diverse, worldwide assembly (ekklesia) of devoted followers of the One who was known during his earthly incarnation as Jesus/Yeshua. Perhaps it's not the theological debates that are important, it's how we love and treat one another, as one human tribe/nation, choosing to INCLUDE rather than exclude. Jesus chose to love and include those whom others excluded - and that choice to rise above and do the right, Godly thing is what made him such a remarkable divine-human being - an example for all of us. And when we can all behave toward our neighbors as Jesus did, then God's Kingdom will have truly come. Just as there were in the beginning, there are many different varieties of Christians. Seems we have come full circle, Alpha - Omega - Alpha. Have we learned our lessons or do we repeat old patterns of persecuting and excluding "heretics" (even to the point of stoning, drowning or burning at the stake?!) Maybe it's time to stop dividing and categorizing and judging "otherness" as wrong, and instead realize, despite varying beliefs, all Christians are Christians, and all are One in Christ. Peace to all. I love reading this blog, too! Jose, you talk about outrageous beliefs, but what is one person's outrageous is another's orthodoxy. I work on a university campus as a chaplain, so when I mix with people of other faiths as an official representative of my own, I often get asked what I believe about certain things. Let me tell you that when I try to explain orthodox Christianity to people who practise other faiths, or none at all, I become conscious that some of the things I take for granted sound outrageous to others. Thank you so much Jennifer D and Lightseeker for so thoroughly illustrating precisely what I’m talking about. It might be good for both of you to nevertheless reread my comments. But simply, so what if it sounds outrageous to others? Is your belief determined by what others think is outrageous? Do we compromise or make wish-wash out of God’s teaching to appease those who do not understand, the unregenerate? If that’s the case you are certainly not grounded in your beliefs. “But what did you go into the wilderness to see? A reed shaken by the wind? I highly recommend you read or reread Emil Brunner’s The Scandal of Christianity. It’s a short work by one of the greatest minds of the 20th century. Before the Pauline editors got at it, I suspect it was something like the following in a completely Jewish prophetic context:"but we proclaim the Spirit, to priests a stumbling block, but to those whom God has called, the Spirit is the power of God." 'Christianity' in all its forms was developed from the theology of Jewish prophets that were still around in the first century. So what is 'orthodox'? I don't like the introduction of technical terms that become jargon making a subject more removed from ordinary folk. But I would rather use more words that people understood to say what I wanted to convey. Interesting discussion and one that I'd like to add a comment or two. First, I take Dr. DeConick's point about the use of orthodoxy and heresy in historical discourse. It really does matter what perspective one wants to take, although I doubt that Marcian or the other non-apostolic Christians would be shy about using either terms for themselves and their enemies respectively. This was, after all, an age which wasn't shy about polemics or particularly mealy-mouthed about them. Yet, the point is well-taken that we need to be careful with these terms. Second, I have no issue with the interpretation that Christianity was pluriform in ancient period. It clearly was. As long as we keep the 'apostolic Christians' in the mix as one option, I see no difficulties. Third, the only objection I have to the term plurodoxy or polydoxy is that I think they are both unnecessary neologisms and jargon. I don't think we need to invent terminology for what is happening in the early church because we can describe it in other ways. That is, we have the terminology to descibe the situation and it has been employed for the better part of a century by religious studies scholars. Lastly, I think we need to discuss what we mean by historical here. Do you mean that you shouldn't study this perspective? Does this mean that this is not sufficiently scholarly? I submit that the position of the 'apostolic Christian' is historical in that it reflects on past events, but what Dr. DeConick means that it doesn't conform to the rules of historical writing. Well, yes and no. Yes, it doesn't take the ideological/historiographical position of modern academic history. No, in that it constitutes a historical perspective within a coherent world view. We've been over this ground, but, really, I have no intention of conceding the ground that there is only one way to write history when it is demonstrably not true. Speaking from the perspective of someone involved in modern Gnosticism, I think the creation of new categories and terminology is an exciting idea, and fully support it. So much of the current discourse about "Gnosticism"-- especially in popular culture, but also among the self-professed-- is based on prejudicial and outdated information (the heresiologists and a bunch of stodgy 19th Century Germans) that the current tropes amongst various parties interested in the subject seem to be one of two. On one hand we see "EEEEVIL FAITH ROBOTS IN THE MONOLITHIC CHURCH SQUASHED FREETHINKING PROTO-FEMINIST GNOSTICS" or "EEEEVIL ELITIST GNOSTIC WORLD-HATERS TRIED TO DESTROY THE EARLY CHURCH." Really, neither of these are correct because all of the categories have long since been illustrated as incorrect. Not only was there no monolithic single Early church, we also know there was no such thing as a monolithic "Gnostic" practice that could be squashed. As these are relatively new ideas in the discourse, we need new phrasology and taxonomy to describe and disseminate them. From my perspective, those of us involved in contemporary Gnostic praxis could only benefit from an understanding of these nuances, and help illustrate that the whole "Black versus White, Church versus Heretic" argument is no longer valid. LOL, I'm in 100% agreement with you there, Jose. The current so-called "modern Gnostic" movement is inundated with "gobbledegook" and new age nonsense. This is why a few of us are trying to move in a more historically honest direction, and are so appreciative of the work being done by scholars like Dr. DeConick. Compassionate Christianity - I Believe - Source: Microsoft Clipart What does it mean to say "I believe"? SARAH LAUGHED Ministry Group WE DON’T HATE ANYBODY! Podcast 8.24: Satanic Imagery And Conspiracies In Modern Culture - Podcast 8.24: Satanic Imagery And Conspiracies In Modern Culture (Download). Ordination of women is a "crime"?! Religious freedom - what is it?